Dukngal Rangdrol (Tib. སྡུག་བསྔལ་རང་རང་གྲོལ་, Wyl. 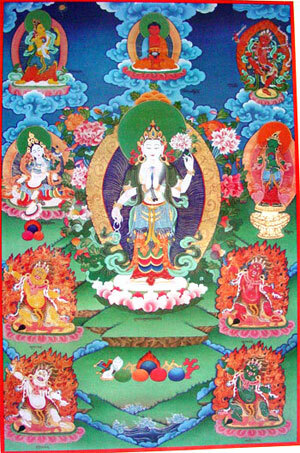 sdug bsngal rang grol), 'The Self-Liberation of Suffering' — a sadhana of Avalokiteshvara from the Longchen Nyingtik. It is classed as a peaceful yidam practice, or as the secret guru practice from the peaceful male vidyadhara section of the cycle. Thus, the teaching on the most profound crucial points of the sadhana, ‘The Supreme Noble Natural Liberation of Suffering’ by the Jetsun Mahaguru was bestowed on the monarch, the dharma king, father and son, on the second storey [of Samyé], in the ‘Glowing Turquoise Covered Shrine Room’. It was placed in a casket of heart treasures and entrusted to them with powerful aspirations. The time for revelation came in the Earth Tiger year, when I had a vision of the Great Compassionate One, and the dakini of the space of wisdom, in the vast expanse of the magical net of illusion, the luminous space, entrusted me with the scrolls of the symbolic script. I wrote it down without concealing anything of the signs and meaning. Dilgo Khyentse Rinpoche, (rgyun khyer) gsang sgrub thugs rje chen po sdug bsnal rang grol kyi rgyun khyer thugs rje'i yang zhun/ vol 4 (sva) pp.477-480; also in gsang sgrub thugs rje chen po sdug sngal rang grol gyi rgyun khyer thugs rje’i yang zhun (Collected Works Vol. 6, pp.148-151/2) – a text for daily practice requested by Dilgo Khyentse Rinpoche’s mother, Karma Drolma. ↑ Alternative translation : ‘Natural Liberation of Suffering’. Tulku Thondup, Masters of Meditation & Miracles (Shambhala, 1996), pages 45, 122-124. Janet Gyatso, Apparitions of the Self: The Secret Autobiographies of a Tibetan Visionary (Princeton University Press, 1998), pages 38, 79, 94. This page was last edited on 2 May 2017, at 06:34.